· Start by cutting the floral foam to fit snuggly inside the vase. Fill with water. · Next, take the largest blooms and stick them in the floral foam. These first few flowers can be placed randomly as a starting point for the arrangement. · Then start filling in with more flowers. For the holidays, any shade of red is great. Bright red is traditional and will draw in the eyes of your guests, while darker reds are more mature andelegant looking. White is also a great color for the holidays as an accent or for the entire arrangement. 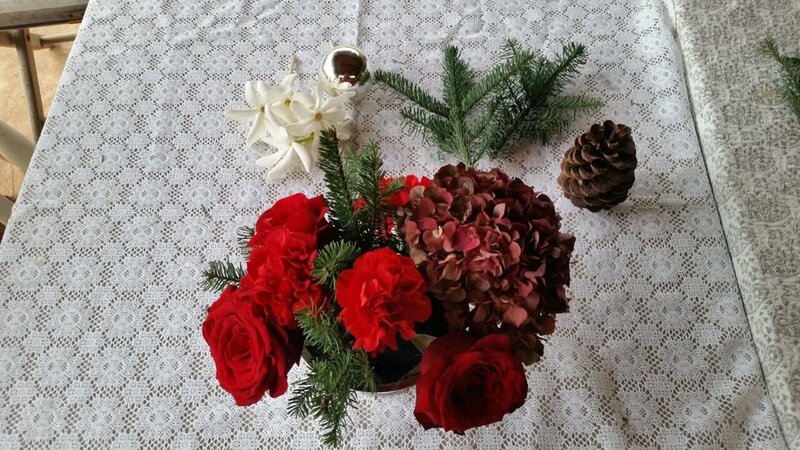 White flowers will create a clean and fresh looking holiday arrangement. Here we are using red roses, red carnation, and white Tahitian gardenia. · After filling in the arrangement with most of the flowers, take the round Christmas ornament and pine cone and attach a toothpick to each using wire and tape. Place them in the arrangement. The pines cone could be spray painted in silver, gold or white or kept natural. Natural or spray painted branches could also be used and would give the arrangement a whimsical quality. · If using tahian gardenia, as we did. Attach toothpicks to stem to help place inside the floral foam. Whichever white flower you use, place in any areas that needs filling and all over as an accent color to the red & greenery. · Lastly, clip a few more longer pieces of pine and place them near the bottom of the arrangement right above the opening of the vase. The variety of pine lengths will give the arrangement dimension and that is a good thing! Looking for more fun DIY projects? Here are two of our holiday favorites from some of our go-to blogs!